Pokémon X & Y, like its predecessors, has introduced a whole new way to battle, Sky Battles. These battles are, as the name suggests, battles in the sky, with the trainers looking from below to view the battle. 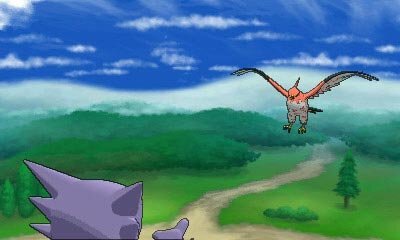 Sky Battles are a new battle mode that only certain trainers will partake in. Within these battles, you can only use a select sort of Pokémon. For these battles, you have to use Flying-type Pokémon, or Pokémon with Levitate. However, even not all of those are candidates with Pokémon such as Doduo and Pidgey being exempt. Mega Charizard X can still be used in these battles despite not having the qualifying factors after Mega Evolving. Within these battles, you are also unable to use moves such as Gravity and Ground-type moves are obviously not going to work. However, other than those restrictions, the battles are largely the same to single battles in the game. Body Slam 15 85 100 The user drops onto the target with its full body weight. It may also leave the target with paralysis. Dig 10 80 100 The user burrows, then attacks on the second turn. It can also be used to exit dungeons. Dive 10 80 100 Diving on the first turn, the user floats up and attacks on the second turn. It can be used to dive deep in the ocean. Fire Pledge 10 80 100 A column of fire hits opposing Pokémon. When used with its Grass equivalent, its damage increases into a vast sea of fire. Fissure 5 -- 30 The user opens up a fissure in the ground and drops the target in. The target instantly faints if it hits. Grass Knot 20 -- 100 The user snares the target with grass and trips it. The heavier the target, the greater the damage. Grass Pledge 10 80 100 A column of grass hits opposing Pokémon. When used with its water equivalent, its damage increases into a vast swamp. Heavy Slam 10 -- 100 The user slams into the target with its heavy body. The more the user outweighs the target, the greater its damage. Ingrain 20 -- -- The user lays roots that restore its HP on every turn. Because it is rooted, it can't switch out. Mud Sport 15 -- -- The user covers itself with mud. It weakens Electric-type moves while the user is in the battle. Seismic Toss 20 -- 100 The target is thrown using the power of gravity. It inflicts damage equal to the user's level. Slam 20 80 75 The target is slammed with a long tail, vines, etc., to inflict damage. Smack Down 15 50 100 The user throws a stone or projectile to attack an opponent. A flying Pokémon will fall to the ground when hit. Stomp 20 65 100 The target is stomped with a big foot. It may also make the target flinch. Substitute 10 -- -- The user makes a copy of itself using some of its HP. The copy serves as the user's decoy. Toxic Spikes 20 -- -- The user lays a trap of poison spikes at the opponent's feet. They poison opponents that switch into battle. Water Pledge 10 80 100 A column of water strikes the target. When combined with its fire equivalent, the damage increases and a rainbow appears. Water Sport 15 -- -- The user soaks itself with water. The move weakens Fire-type moves while the user is in the battle.